The brains behind Kinect's brains and a major hardware manufacturer are bringing Kinect-like motion control to the PC in 2011. PrimeSense, the company behind the 3D-sensing technology inside of Microsoft's Kinect, has announced the specifics behind its previously revealed intentions to bring a Kinect-like interface to the PC. 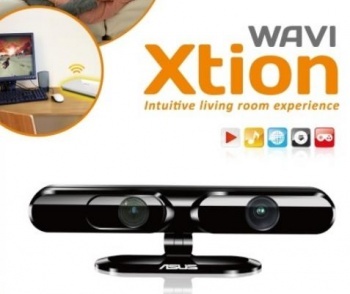 PrimeSense is teaming up with hardware manufacturer ASUS for the WAVI Xtion, a motion-sensing PC control device which could have users jumping around their living rooms when simply trying to open iTunes. The WAVI Xtion package basically plops a very Kinect-like camera in front of your television, while two boxes wirelessly send content from PC to TV (up to 25 meters apart). The big difference is that the WAVI Xtion camera eerily looks like the robot's face from Short Circuit. PC content can be controlled on a TV through the WAVI Xtion, using motion-based commands such as waving your hands and cartwheeling to flip through music and such. According to one of the released press images, ASUS and PrimeSense apparently want us to know the release of the device means we'll be able to control our PCs with nothing other than our hot pants. The two companies will be showing off WAVI Xtion at CES 2011, which takes place from Jan 6-9 in Las Vegas. They'll hopefully also reveal how we're supposed to pronounce "Xtion." Ex... shun? Ex... tie... on? Nope, I can't figure it out. WAVI Xtion is scheduled for release in the second quarter of 2011, though a price on it hasn't been revealed. Also announced was Xtion PRO, a professional development "solution" created so that software developers can put together motion-sensing applications to be used with the WAVI Xtion device, to be sold on an Xtion-branded store. Xtion PRO will be available in February 2011.